I want to use this page to highlight some other Disney collectibles that I enjoy. Disney collectors have a universe of “Disneyana” to choose from. I collect mostly paper items: postcards, comics, paper, books, advertising and the like. Everything you see here is out of my own collection. So…imagine you are in my living room and I have just brought out some stuff from my “archives”! I hope you enjoy this stuff as much as I do. Walt Disney’s Comics and Stories began publication in 1940. At first it reprinted Silly Symphonies Sunday newspaper comics as well as Donald Duck and Mickey Mouse daily strip comics . Most of this work was originally done by Al Taliaferro, Ted Osborne and Floyd Gottfredson, but other artists were involved as well. It wasn’t until issue 24 that the title included original work. Issue 31 (1943) saw the first Carl Barks art work. Barks went on to become the most celebrated and famous of all the Disney comic book artists, working on hundreds of stories through the mid 1960’s. The early issues of the title contain all kinds of great featurettes: Minnies Hollywood Chatter, the afore mentioned Silly Symphony comics and text stories based on Silly Symphony films, a puzzle page, and of course the great comics from Walt Disney Studios. Shown here is issue 16 (Vol.2 No.4) The artist for this fantastic cover is not known for sure, but it is likely Al Taliaferro. It has a great feature length Three Little Pigs story, a Dumbo text story, Pluto strip comics, and Donald and Mickey as we would expect. These early books from the Golden Age of comics were 64 pages…so they packed a punch! If all this sounds interesting…check out these Walt Disney’s Comics and Stories for yourself and start a collection today! Since the early days of the Disney company, the studio actively sought out ways to expand the brand. In the US, a tremendous push was made to manufacture and sell promotional items of every imaginable kind. (The Walt Disney Family Museum in San Francisco has a great selection of these early items). But Walt and Roy also sent Mickey and the crew over-seas to Europe. 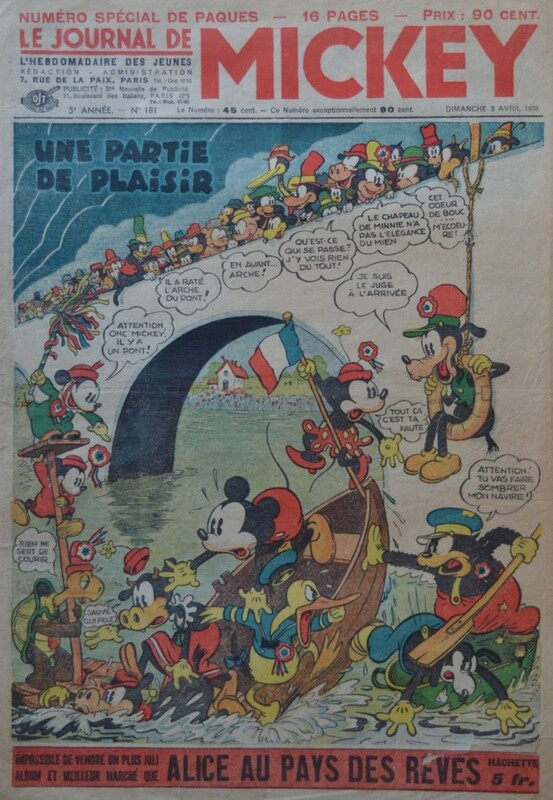 Le Journal de Mickey, which was first published in 1934 only six years after Mickeys creation, is evidence of this push. The French and Belgain markets would have been ripe for this sort of thing. At the time, cartoon characters such as Herge’s Tintin and Quick and Flupke were already in full swing. Today, outside of the US, France has one of the most active comic book, or bandes desinées, markets on the planet (the other that comes to mind is Japan). As far as the art work in these publications, I suspect that most of it was produced in the US and captions were added by European staff. The issue of the magazine I show here is from 1938. Notice the early image of Donald Duck with a longer bill than he ultimately had. 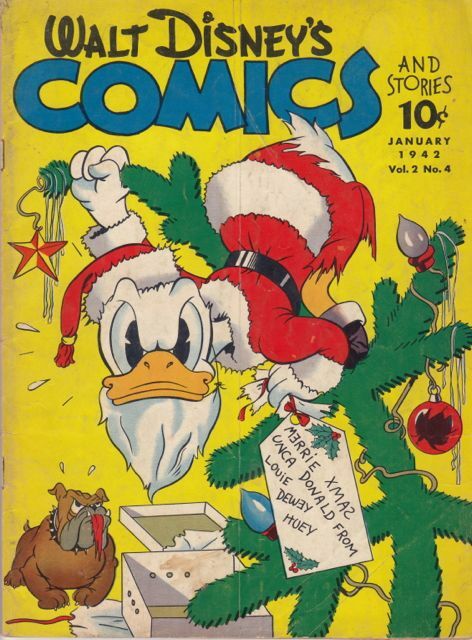 The first appearance of Donald in a US based comic publication was in 1934. This was an adaptation of the Wise Little Hen Silly Symphony story. Getting a copy of any of these very early comics will not be cheap…but these relatively early Journal de Mickey comics are easy to find and very reasonably priced (usually less than $10). Of course, it helps if you are in France! If you are interested in finding copies of Le Journal de Mickey , I recommend going directly to ebay.fr . There just aren’t that many copies available in the US. This is a large field of collecting and quite a few people participate in it. I have not actively participated, but I do occasionally dabble. Tickets from the early days of the park are highly collectible, and instead of going into to the details here, I will just refer you to Vintage Disneyland Tickets. He has a lot of interesting scans and info on early park tickets…and other stuff too. Shown here is a complete Disneyland and Santa Fe Rail Road ticket I picked up at an estate sale a long time ago. I actually bought two of them…this one and a yellow one. I sold the yellow one but wanted to keep this one! Note that the ticket includes a stop at Holidayland. That dates the ticket to pre-1961 since that is when Holidayland closed. If you are interested in starting a collection of Disneyland tickets the easiest thing to do is check out eBay . Short of that, your next best option is to go to a Southern California Disneyana show! Starting back in 1988, Disneyland actually started printing its own currency. Of course, the currency is only valid at a Disney property, but in true Disney fashion, this currency didn’t just show staid pictures of Disney chief executives! No..this currency was colorful and full of characters from every part of the Disney universe. I have put a small (but growing) collection of these dollars together, and they really are fun to pull out and look at from time to time. And as I have said in a post on the site, if one ever tires of this hobby all you need to do is bring the dollars back with you to WDW or Disneyland, and you can spend them! In some cases that would not be advisable. Some of these bills are worth far more than face value. You can start your own collection of Disney Dollars rather easily. At any given time there are many listed on eBay. And for a fantastic reference on the topic…check out DisneyDollars.net.